Part of me understood why Bethenny Frankel got mad at Sonja Morgan for trying to launch a proseco line called Tipsy Girl. Another part of me felt like she gave it way more attention than it deserved since it could never be a legitimate competitor to Bethenny’s Skinnygirl brand. 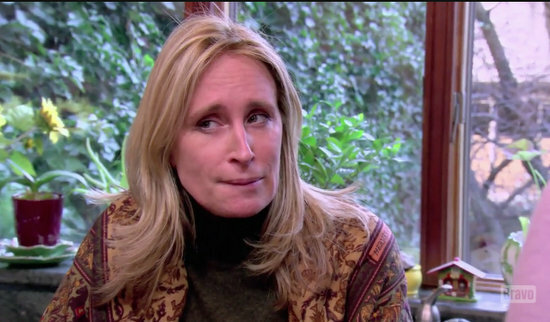 I don’t get why Sonja trying to sell alcohol is different than any other Real Housewife who has done the same thing- and there really are a lot of them who have. Nevertheless, this whole thing has resulted in a lot of unnecessary drama that just keeps going. There’s a lot of confusion over what exactly is going on between Bethenny Frankel and Sonja Morgan. Bethenny, and her “Zero F–ks,” ripped Sonja a new one for promoting a new prosecco called Tipsy Girl, which Bethenny called a “Cheater Brand” because it was too closely related to Skinnygirl. I co-sign that the name is absolutely a calculated play off of Skinnygirl, and I agree with Bethenny that, on a personal level, she has every right to be angry at her so-called ‘friend,’ but on a business level – is Sonja really stepping on Bethenny’s turf? In light of all the confusion about what’s legal, and how exactly Sonja’s brand could possibly be a threat to Skinnygirl, the Real Housewives Of New York star explained about trademarks on Twitter, and Bethenny announced plans to produce her own business show! Bethenny Frankel Radio Show And New Skinnygirl Product Coming Soon! Bethenny Frankel really can do it all. It seems like there is no limit to what Bethenny will add to her personal brand. Now, she can add radio host to her resume. Bethenny will soon host her own radio show on Andy Cohen‘s Sirius XM station Radio Andy. Bethenny‘s show has the perfect name too: B Real with Bethenny. B Real with Bethenny will be a two-hour show that airs once a week starting on May 2, so her fans won’t have to wait too long to hear Bethenny‘s opinions on the radio. This seems like the perfect fit for Bethenny since she already has hosting experience with her now-defunct talk show Bethenny. Bethenny Frankel is determined to have Skinnygirl take over the world. The Real Housewives Of New York star brags that she’s a businesswoman, not a reality star, however she won’t hesitate to slavishly use reality TV to promote her never-ending barrage of products. The latest Skinnygirl offering? Candy. We’ll talk about Skinnygirl candy a bit later – first let’s talk about Real Housewives Of New York and Bethenny’s legal wranglings with Sonja Morgan! You know – our version of candy. Last month Sonja Morgan unveiled Tipsy Girl, a new prosecco she is promoting. It was widely predicted that Bethenny Frankel wouldn’t be too happy about the name given that Tipsy Girl sounds remarkably similar to Bethenny’s infamous Skinnygirl line. Now the two former frienemies are locked in a trademark dispute via their business entities. Sonja’s business partner, Peter Guimares, dismissed the name similarities and argued that he had trademarked “Tipsy Girl” (two words) months earlier. At the time, Bethenny had no comment on her Real Housewives Of New York co-star’s tipsy business venture, but instead made a move to trademark the name “Tipsygirl” (one word!). Cyber Monday is the day to shop online, so we decided to help you knock a few things off your holiday gift list and show a little love to the people who bring us all together every day, the reality TV stars. Goodness knows that there is NO shortage of stuff from which to choose, but here’s our pick for the best of 2015. Above: Kim Kardashian and Khloe Kardashian at the launch of Kardashian Beauty, geared towards women who covet the “dead woman walking” and the “plumped to the nines” look. Take a look below for gift suggestions courtesy of Lisa Vanderpump, Farrah Abraham, Luann de Lesseps, Shep Rose, Peta Murgatroyd, Kristen Taekman, Meghan King Edmonds, and many more.